I met Jamie Sawyer when I taught at the Omega Institute (which was awesome) and she was super nice and gave me one of her decks. So sweet. I love the colors and style – similar to tattoo style (she also tattoo’s) (and does henna) and I fell hard for it. 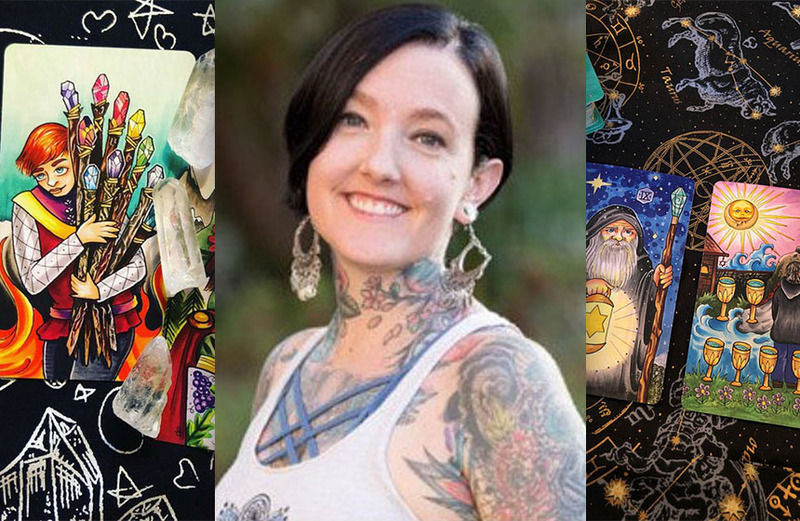 Jamie is working on a Lenormand deck, and I can’t see what else she’s got up her sleeve, but she stopped by to talk and say hi! I’m short, crafty and have a lack of vices… My creative mind likes to fill my “free” time with all the things; drawing, sewing, jewelry making, Henna. I’ll think of something, and have a prototype within a few days… it’s how my busy brain works. I have been lucky enough to make my living as a Tattoo Artist for the past 16 years. Each day that I get to bring people’s ideas into physical form for a lifelong memory, makes my heart swell a little more. Lately though, my tattooing has become more of a conduit to share soulful experiences with my clients. It’s so much more than just the artwork.. We talk about everything from the mundane to soul expanding issues! I truly am grateful each and everyday, for my clients- who have become friends, and some feel like family after all these years. I have always been interested in the metaphysical, from crystals, to alters and rituals, to cards. I got my first oracle deck back in 2000, The Faeries’ Oracle, by Brian Froud and Jessica Macbeth. (I still have it). Shortly after that I gifted myself the Morgan-Greer Tarot. It was and still is a deck that I align with. A few years ago, a tattoo client of mine asked me for a 3 of cups as a tattoo. I had so much fun illustrating it in my style, that I went home and began to sketch the Queen of Swords (She’s the card that at the time was my significator). I wanted to see how I’d turn her into a tarot-style tattoo. After I finished the red pencil sketch…. I thought to myself “Oh crap, did I just begin drawing my deck? !” Yep… and like that it had begun. The whole sketching process took me just over 2 weeks for all 78 thumbnails, my brain had become a conduit for creation…. I would watch TV with my partner, Tim and our Basset Hound, Barney- sketchbook/ pencil in hand, research books on the side and all my notes…. It took me 2 years to line/ color, scan and tweak all the cards, as life tends to happen and projects get put on the side burner. I made peace with the Deck and knew that it would be birthed at the perfect time and not a minute before. At the end of 2017, I decide to take a social media break and color the last 36 cards, it’s amazing what one can do when they don’t have the digital distractions. At that time, my mother Gail was needing a distraction from her daily life and I asked her to write the “blurbs” for my LWB. 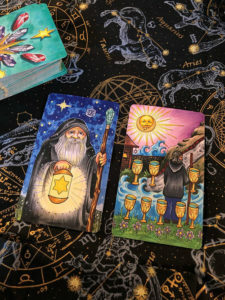 She took my notes, meditated on each card and wrote what came to her from looking at my images… That’s when “Sawyer’s Path” A Tarot Journey was named. It became a collaboration at that moment in time. I’ll cherish her words for many years to come. They may not be the traditional explanations for the cards, but they are her wit, wisdom and feelings of my drawings. I knew then that it was the perfect time for Our deck to come into the world. Happiness to me is being free from the imposing burdens of society…. even if for a moment. It’s sitting outside with my partner, watching the birds at the feeders and the deer eat from the pear tree. It’s a snow day with my dog, pajamas and some hot cocoa, it’s talking on the phone to my mother for what can become hours. It’s sitting at my art table getting lost in the subject of my focus… whether that be books, markers, paint, henna or Tarot Cards. Happiness is being fully present in the moment and shutting out the “what I have to dos”. Misery is when I let that inner voice run rampant about the “what ifs” “what coulds” and the “you know,this also might happens” believing the negative self talk. Misery is getting lost in the ego mind and taking it personally. “We are the manufactures of our own misery”. I have very few close friends, I’m pretty introverted. I appreciate that, even though we may not talk everyday- when we do it’s like no time has passed. I love how we can laugh and enjoy the little things together. I enjoy breakfast and catching up. I also am grateful that they know this is how I am and if I cancel at the last minute, they don’t take it personally… for they just know I need that alone time. My favorite color is a light teal/ blue. My favorite flowers, wild flowers… I love the way they growing out of control, as if to say “ you can’t contain me! I’m gonna bloom where I want!” Also, they bring the bees and butterflies…. and who doesn’t love them?! Hmmmmm.. That’s a tough one. Perhaps listing who I’ve been on previous Halloweens would help… hahaha. Blossom (Power puff girls), Harley Quinn, Poison Ivy, (many many years ago in self made costumes) Mrs. Lovett, Freddy Krueger (I was 10, I think), Selene from Underworld (A couple times)… Looks like I have a thing for anti-heroes. Oops. I do enjoy Batman more than Superman, (perhaps it’s the introvert in me) and growing up I definitely wanted to be Princess Leia at times, but being a child of that era, who wouldn’t?! My Mother. She has overcome so much in her life and truly is a constant source of inspiration and wisdom. I also find the older I get, that I’m drawn to confident, strong women… those who speak up for themselves, unapologetically and authentically… I hope to one day become the same type of woman. I’d have to say pretty fantastic. I wouldn’t trade being me right now for being 20 year old me. I like this version the best yet. I use it daily. I love the morning ritual of pulling a card and diving deep into the meaning. It sets a tone for my day. Lately my dreams have become fairly vivid and some things even prophetic; not always but I’m more alert to the patterns when they do. I love seeing the animal messengers that greet me daily and look to their wisdom. Also in my work life, when I have a client in my tattoo chair, I feel that I become a conduit for messages to them… Sometimes I say things that they needed to hear, and then I don’t even remember what was said. They’ll shoot me an email later and say “this really helped me thank you…”. I love being tuned in and able to share that with them. 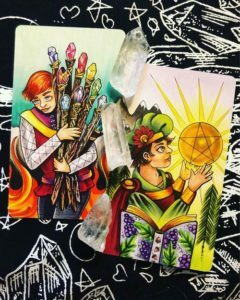 What is your favorite deck or divination tool? mages, the bright colors and the somewhat positive spin to otherwise traditionally dark cards. I’ve been amassing quite the tarot collection as I’m a sucker for art and the beauty some artists put into their cards, well I want to support that! The noise a humming bird makes, google it, it’s adorable. You spent your time wisely.